Since then, they had not won a world series championship, making them the professional team with the longest championship drought ... at least here in the United States. Or at least ... that was the case before the 2016 World Series. The Cubs are now World Champions. I'm not really a baseball fan. I like to go to games from time to time, and I do watch parts of playoff games sometimes. But, I find myself cheering for the Cubs. I did go to Jr. High and High School in the Far North Suburbs of Chicago, and they had a few decent teams back then. I guess I'd like to see them do well. At the same time, I think it is funny that the Chicago Cubs have this incredible streak going. Part of me wants the losing to continue. 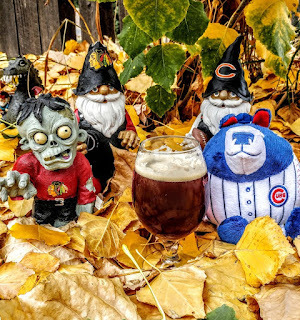 Anyway, I decided to make a beer in honor of the lovable Cubbies. At first I thought a Bock would be a good choice. I have Brother Bear Dopplebock and a Cub is a little Bear just like a Bock is a little Dopplebock. However, a Bock is still sort of high in alcohol for me. I wanted something just a little more sessionable. So, I moved to Munich Dunkel, which is really mostly a sessionable bock. Sort of. I started with Jamil's recipe. I modified a bit. Lots of Munich Malt with a bit of Blackprinz for color. Hop are basically in there to balance out the sweet maltiness, although I did put a fair amount of Hallertau in for flavor. It is a nice easy-drinking beer. Maybe I'll make this again next year if it looks like the Cubs are going to make the playoffs again. For more information about this beer ... see Sheppy's Blog: Cubs Win. Make yeast starter few days ahead of time. Chalk and baking soda in the mash water to most closely match Munich water as I can from my starting water profile. Ferment about 2 weeks. Try to keep temperature in the 50s for week one. Let rise into 60s over week 2. Force carbonate to 2.5 volumes. Condition to taste. Brew day today going well. Mash temp got up to 160, but I think that will be fine. Forgot to do my starter yesterday, so it is going as of early this morning. Fermentation going strong. Put in blow-off tube yesterday. Added ice both days. Temp in mid-50s. Kegging today. 1.016 FG makes this a 4.2% ABV beer. Delicious. Nice munich maltiness with enough hop bitterness to balance it out. Not sweet at all. Beautiful brown beer. Pretty clear. I am pleased. Tried a pint from the keg. Exactly what I wanted this beer to taste like. Still needs catbonation, but this is fantastic. Carbonation getting better, but still not quite where I want it. Really a tasty low alcohol beer. Carbonation is where I want it. Flavor is still exactly what I want. The low alcohol makes me drink lots on Sunday afternoon/evening. Munich malt with the low alcohol is awesome. Awesome I tell you. Made chili with this beer. Won a little work competition with it. Still tasting great. Finally got some pictures for this page. This beer is not going to last long. It is almost gone. Keg blew last night. This beer didn't last real long, but it was great while it lasted.